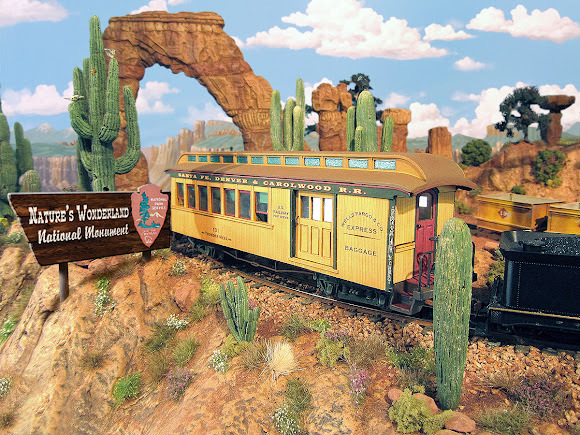 It's another beautiful morning in Thunder Mesa Country as engine #4, the Earl Vilmer, heads for Geyser Gulch and points beyond. It was back into construction mode this last week as new benchwork begins to take shape on extensions of the TMMC. 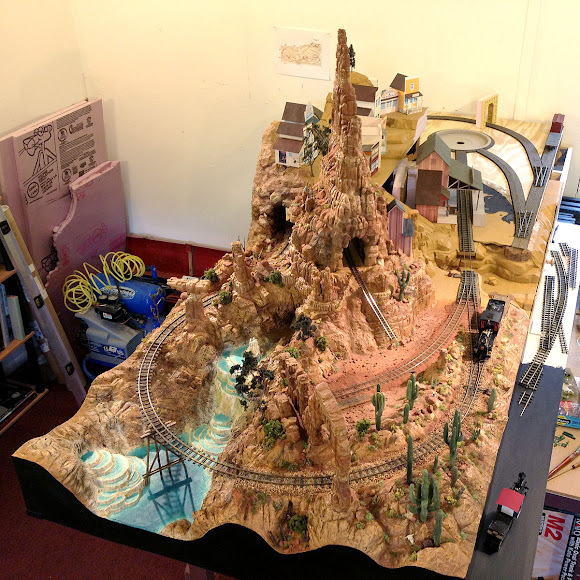 The final shape of the layout is beginning to come into focus now and there's finally a plan for proceeding with the backdrop. Benchwork for the new Calico section of the layout is now complete and, with that, the layout has officially grown beyond its original "mini" status into a larger around the walls pike. The TMMC begins to assume a U shape with the original Thunder Mesa section in the foreground and the new Calico section under construction in the rear. 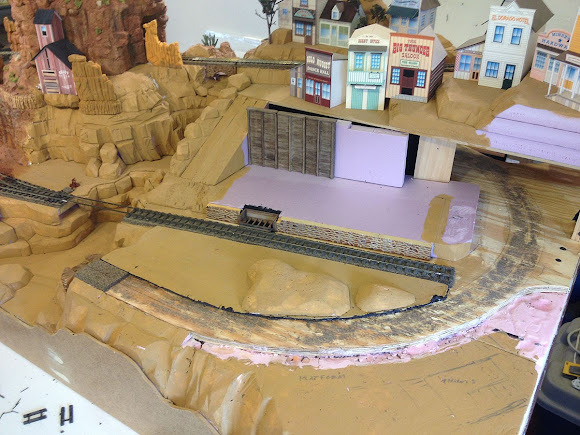 The new section brings the mainline around the corner and begins the transition into the planned Tumbleweed section that will be built next where the bookshelves are located. A closer view of the Calico section. 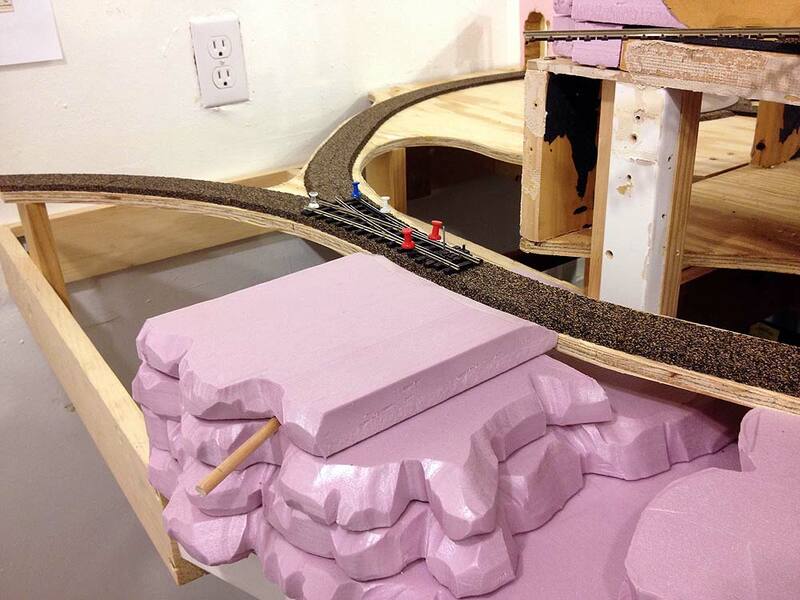 The 1/2" plywood sub-roadbed for the TMMC mainline is in place, awaiting cork and track. A portable On18 Calico Gold Mine micro-layout will be built above this framework. Here one can also see my typical "box and stilts" benchwork method. 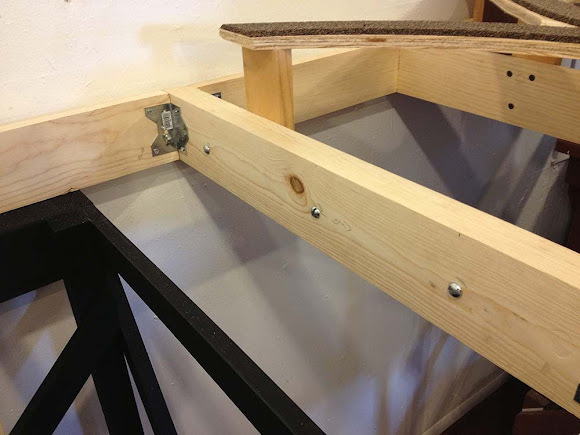 The box-frame is built from 1x4" clear pine, held together with glue, drywall screws and steal corner gussets to keep things strong and square. The entire table-top assembly is built separately from the legs to make things easier to move should the need arise. The leg/support assembly is built from clear pine and MDF; painted Krylon flat black. The box-girder layout section attaches to the top L-girders with 6 screws. Swiveling casters make it easy to roll out from the wall. Old and new layout sections are leveled and then joined together with 1/4" bolts/wing-nuts. Strong and secure, but east to disassemble if need be. The TMMC was originally planned and built without any thought of a backdrop, but now that things are growing out along the walls of the room the obvious need for some kind of backdrop has reared its head. 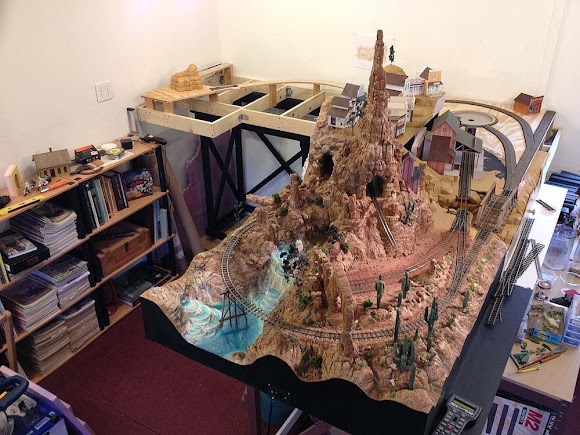 I have built backdrops before for other layouts, mostly from Masonite, with seams carefully taped, mudded and sanded to give an unbroken sky view. Two problems arise from this method, the first is that the final structure is not in anyway moveable (let alone portable), and the second is that those carefully hidden seams almost always split as the Masonite expands and contracts with the inevitable radical swings in Arizona's humidity (it's not aways a dry heat). I'd really like to avoid both of those problems this time around. 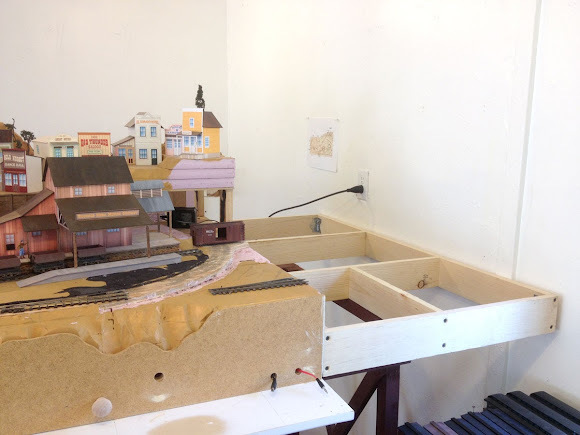 My imperfect solution will be to build the backdrop in sections, with each removable piece matched to a section of layout. They will all be painted to blend together but, unfortunately, some seams in the sky will be unavoidable. The good news is that the seams are barely noticeable durning regular operations, and can easily be Photoshopped out in pictures. Stay tuned for more on this as the backdrop plans develop. I love coming up with simple and effective mechanisms for animations and operating functions on the layout. Some modelers jump straight to electric motors, servos and complex electronics to get things done, but I have found that the simplest solution is often the best and most reliable. 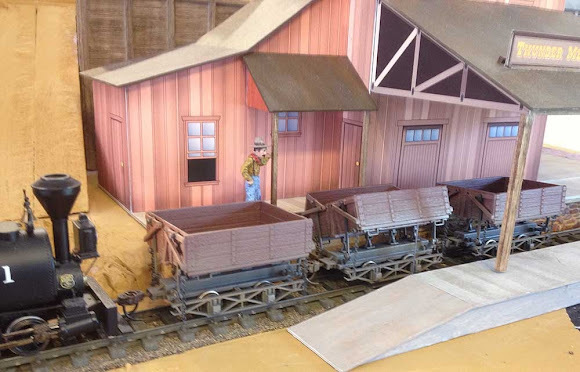 I wanted an operating ore dump to use with my Bachmann side-dump ore cars at the Big Thunder Mill in Thunder Mesa. The dump itself is a wooden grate cut into the platform where a below ground bin is located to collect the ore. 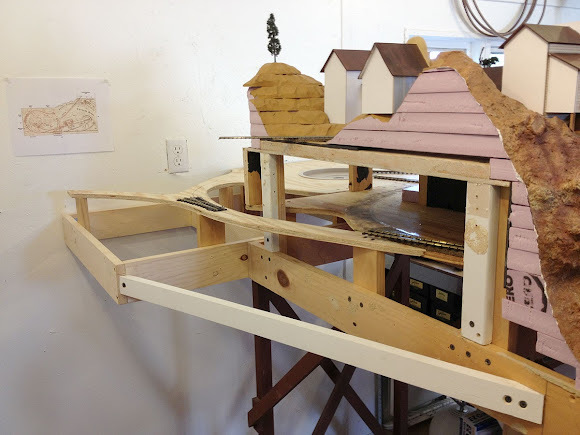 The fiction here is that a conveyer belt inside the mill moves the ore to the upper levels where it can then be fed into the stamps and processed. Looking closely one can see a short length of music wire rising from the roadbed to dump the car. The Bachmann ore cars are metal, and the weight allows them to fall back into place once the wire is lowered. A little oil on the moving parts helps with this. Deep inside Rainbow Caverns is a hidden wye. 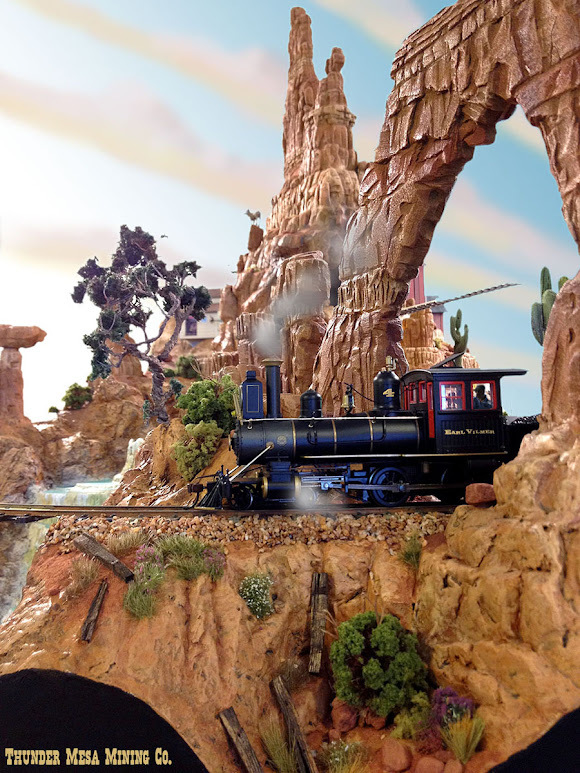 Taking the right leg completes a loop back to Thunder Mesa and allows continuous running, while the left leg allows trains to continue on the main line. Switches inside tunnels can be problematic so I came up with a simple push-rod mechanism to remotely operate the switch. A 3/8" hole was drilled into the roadbed below the switch throw-bar and a large paper clip was bent to shape, one end leading upright through the throw-bar hole, and the other bent through a hole in a 1/4" wooden dowel. 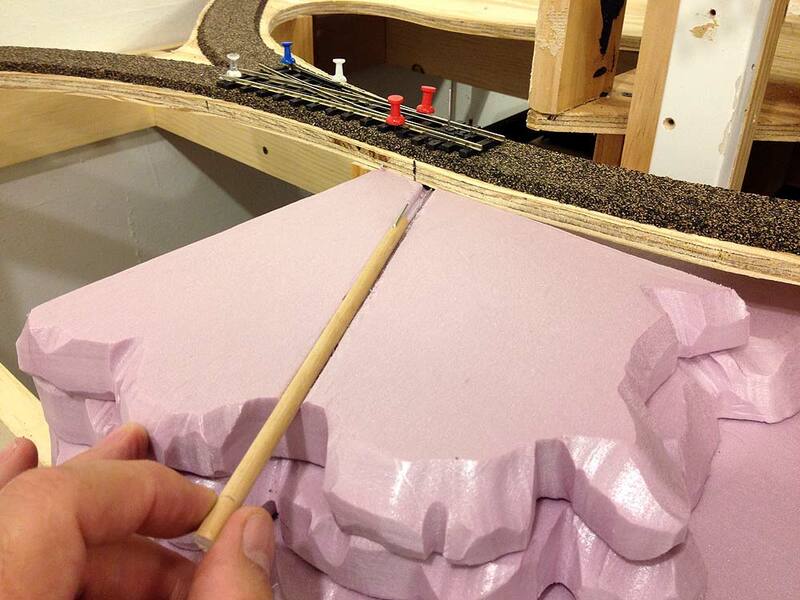 A snug trench was carved into the foam scenery base to guide the pushrod and keep it straight. Note that this mechanism only works because the points on Peco On30 turnouts are already sprung. Other turnouts would require something a bit more complicated to maintain pressure on the points. The completed foam "sandwich" holding the pushrod in place. When the scenery is complete the end of the rod will be disguised as a rock. The track has now been completed through this section and the mechanism works flawlessly. Okay, that's all for this time. I'm hoping to have more regular updates from now on, probably once a week on Mondays as work progresses. Thanks for stopping by! Track and roadbed removed from expansion area. 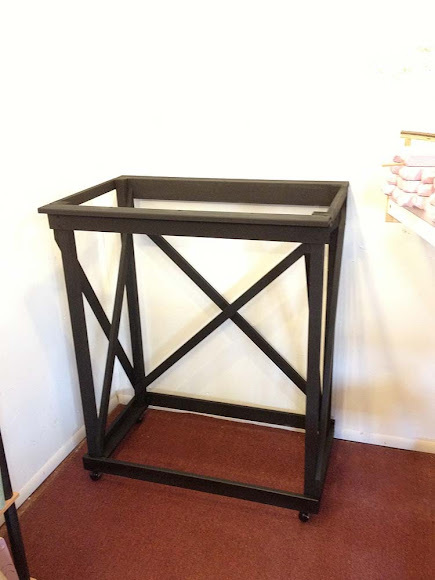 New 2x4' benchwork section added. 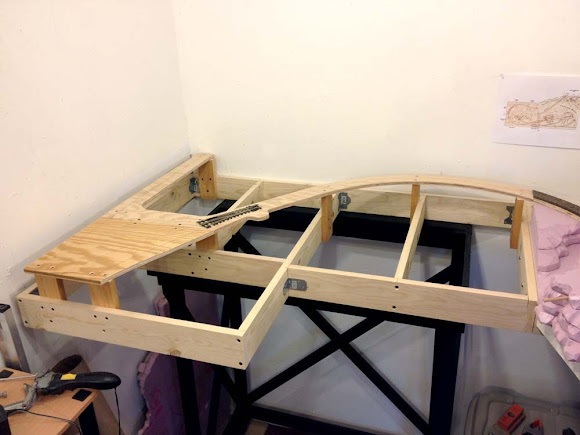 I build my benchwork from straight, clear pine using yellow glue and drywall screws at the joints, and steal angle braces to keep things square. What can't be seen in these photos is the extra set of legs that were also added to support the weight of the new section. Risers and sub-roadbed in place. 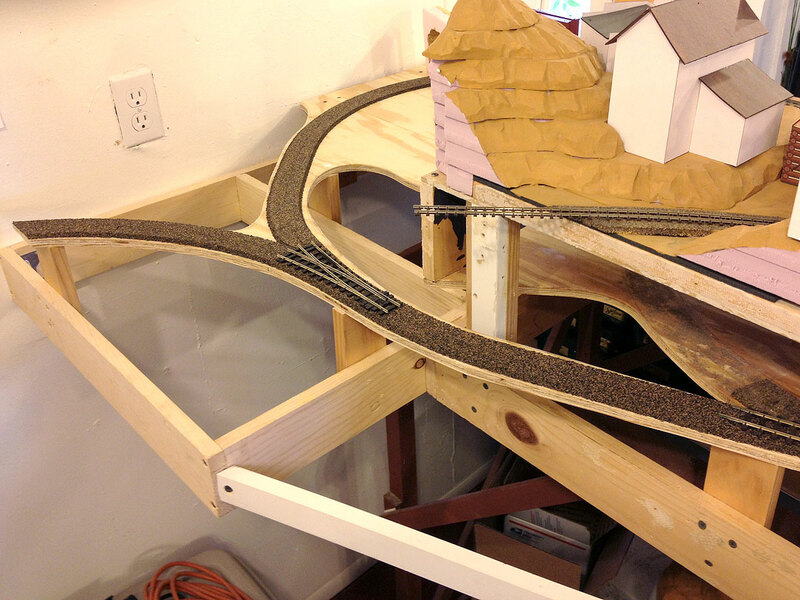 I prefer to test fit track components as I go as it prevents surprises down the line. 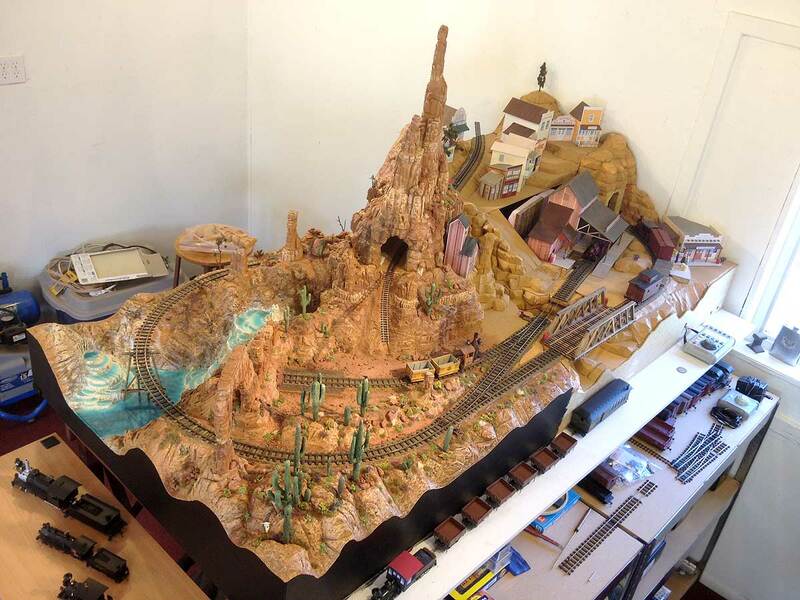 Some creative imagineering was required for this new bump-out section on the back of the layout. This is the former location of the tunnel access hatch and will now be a scenicked rock wall with cave-holes to view the interior of Rainbow Caverns. 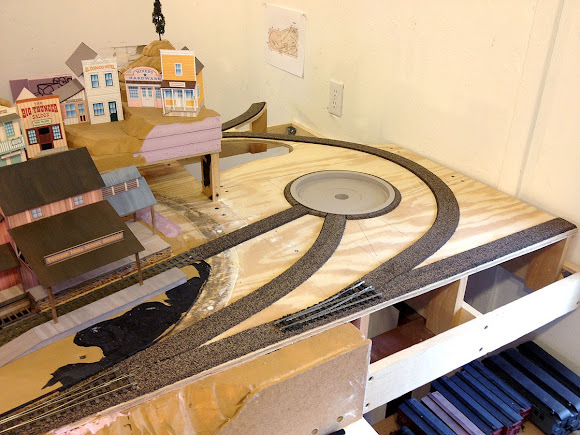 The new layout section with cork roadbed in place. All the holes and gaps in the plywood sub-roadbed were filled with putty and sanded smooth. 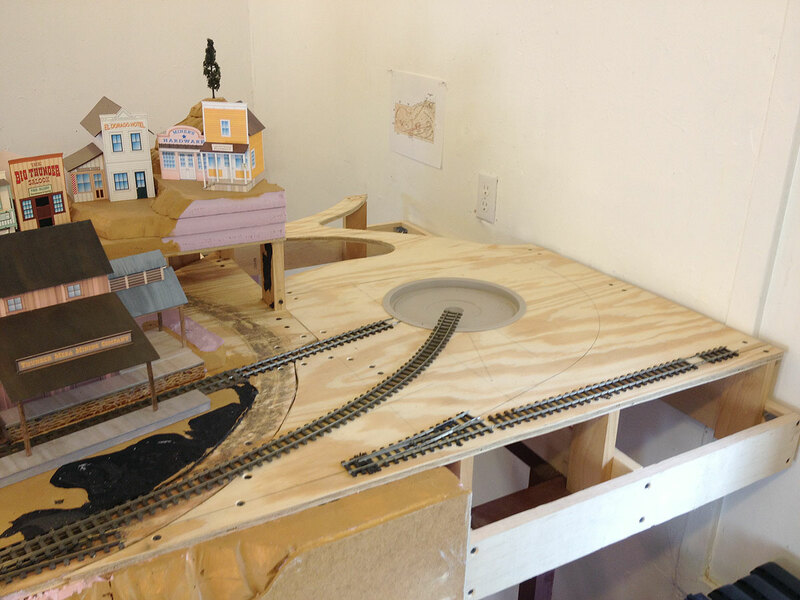 The turntable pit is from a Walther's N scale kit that I will be converting to On30. Over on the Caverns side, this wye switch will lead to a new staging area and, eventually, a whole lot more railroad. Now I'm just waiting on an order of On30 flex-track to arrive. With any luck, trains should be running on Thunder Mesa again by the end of this month!